Likud National Committee and Binyamin branch Chairman Natan Engelsman responds on Arutz Sheva to Justice Minister Ayelet Shaked's warning that if the Likud wins 40 seats in the next elections, a leftist government will be formed. 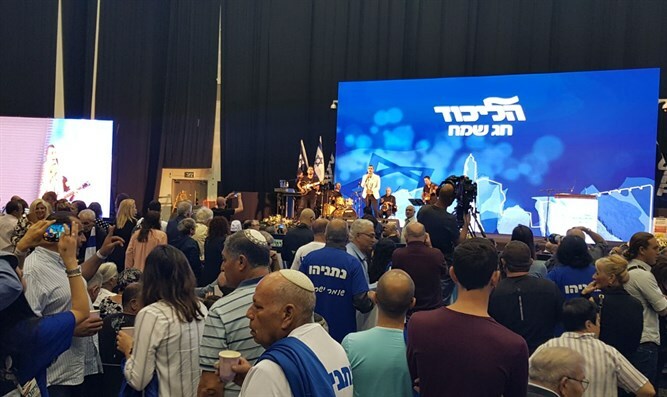 Shaked had stated at a news conference: "The last time the Likud had 40 seats was the disengagement, I won't give you the pleasure of appointing a prime minister again." Engelsman responded: "The partnership with Jewish Home is a natural and unrivaled partnership. There is no more natural partner to lead the State of Israel. This partnership will continue and it's irreplaceable. To establish a stable coalition, the natural partners are certainly the Jewish Home and the haredi parties and other satellite parties." According to him, in order for the government to be stable, the ruling party needs 40 Knesset seats, "I think it's a national interest for stability and there is no interest in eliminating the Jewish Home. We're not dealing with competition, but with national interest." Engelsman is proud of the Likud Party, which he says is currently working apply Israeli law in Judea and Samaria. "Yesterday there was a huge conference and those who heard the former minister Gideon Sa'ar, contender for Netanyahu's post after he finishes, stated that one of the main issues for him was our right to the land and the application of Israeli law to Judea and Samaria. This was also stated by Minister Gila Gamliel yesterday during a Land of Israel Lobby conference that she supports the decision to apply Israeli law in Judea and Samaria. This morning we also heard Minister Yariv Levin talk about this. "We demand that after 51 years, the settlers in Judea and Samaria - about half a million Jews - will live a normal life like any other citizen. So we have no competition with Jewish Home and we'll continue to be partners in advancing national interests."